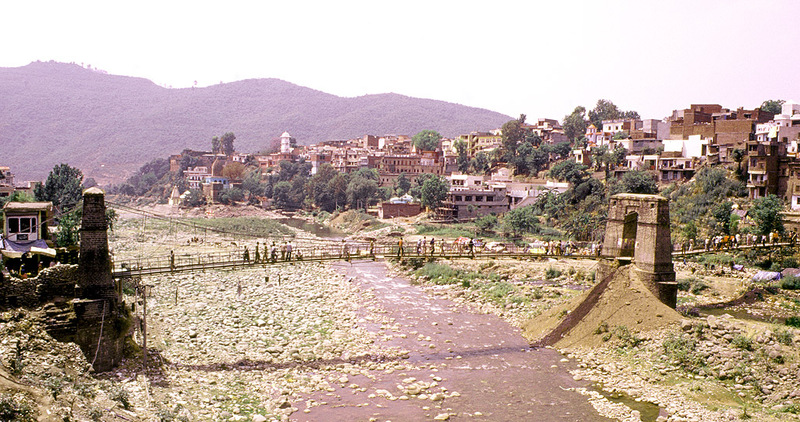 The picturesque town of Rajouri is located about 150 km from Jammu, on the Poonch highway. The place is known for its beautiful lakes and serene ambiance. It was this quaint town that was once the ancient capital of the Kamboja kingdom of the north-west, as early as the first millennium BC, when it was known as ‘Rajapura’. The earliest references to the Kambojas are found in the Sanskrit grammarian Panini’s works, in the 5th century BC. Even in the mythological texts such as the Manusmriti and Mahabharata, the Kambojas find mentions. They are described as fallen Kshatriyas (warriors) who were said to have degraded from their position due to failure to abide by Hindu sacred rituals. In the Mahabharata, there is a reference to Karna conducting an expedition against the Kambojas, at the behest of Duryadhona, the result of which was that the Kamboja tribe fought alongside the Kauravas in the Kurukshetra war. The later Puranas also mention the Kambojas as an Uttarapatha (North corridor) tribe who along with the Sakas, Pahlavas, Barabaras and Yavanas constituted the Uttarapatha Pancha-gana (five hordes of the North corridor). Historical studies on the ethnicity of the Kambojas suggest that they were of Indo-Iranian race (sometimes referred to as Indo-Aryans) who had their territories beyond Gandhara - in modern day geography, beyond Afghanistan and lying in Tajikistan, Uzbekistan and Kyrgyzstan areas. During the Mauryan period, the Kambojas ruled independently and were friendly with the Mauryans. This is evidenced by the excavated Buddha statues, edicts and inscriptions of Ashoka regarding spread of Buddhism, found in the area. By the Maurya period, the Kambojas had crossed over the Hindu-Kush range and entered Gandhara kingdom and settled in the region extending up to Rajapura (western face of Kashmir). The extent of the Kamboja kingdom, in this context, therefore ranged from the valley of Rajouri (Rajapura) in south-western Kashmir to the Hindu Kush range, with its borders extending probably as far as Kabul, Ghazni and Qandahar. In Sanskrit Puranic literature, this region has been named as ‘Komudha dvipa’ (the land of the Komudhas), while the Greeks referred to it as ‘Komedes’ (ref. : geographical writings of Ptolemy). The Kambojas were also referred to as the Ashvakas, primarily because of their excellent breed of horses (Sanskrit: Ashva). They had been referred to in the Mahabharata as “ashva-yuddha-kushala” (men expert in cavalry war). In the Maurya period, Ashoka made a prominent mention of the Kambojas in his Rock Edict no. XIII, which described the Kambojas as “araja vishaya” meaning, kingless, which implied republican polities. In Rock Edict no. V, we find mention of Ashoka having sent Buddhist missionaries to the Kamboja land to convert the population to Buddhism. Kamboja was included and recognised as one of the 16 Mahajanapadas (kingdoms) in Aryavarta since the days of the Mahabharata. It had its capital in Rajapura (present day Rajouri). The Mahabharata mentions that Karna led an expedition to Rajapura just before the Kurukshetra war in order to gain their support for Duryodhana. In other references, especially in Kautilya’s ‘Arthashastra’ and Panini’s ‘Ashtadhyayi’, Kamboja’s capital is described as Rajapura which is the place of the King of Kamboja, who in turn is described as a ‘titular head’ of a republican form of government. The line of Kamboja kings in Rajapura, as mentioned in the Mahabharata are Chandravarmana Kamboja (the first Kamboja king), Kamatha Kamboja and Sudakshin Kamboja who fought in the Kurukshetra war on the side of the Kauravas and were slain by Arjuna. During the Sikh uprising of the early 1800s, Gulab Singh, a general of Maharaja Ranjit Singh of Lahore annexed Rajouri and made it a part of the Sikh Empire. Later, during British Raj, Gulab Singh was made the Maharaja of Jammu and Kashmir and Rajouri was ceded to him. Thus Rajouri became a part of Jammu and Kashmir and continued to stay so after Independence and partition. However, in 1947-48 and in 1965, Rajouri was severely affected in the India-Pakistan wars, primarily because of its strategic location very close to the border. In 1965, during the Second Kashmir War, Rajouri was captured by the undercover Pakistani militia but later they withdrew their troops. Rajouri today stands as a small town and municipal council, and home to some of the Kamboja ruins which remind visitors of its ancient history. Photo: View of modern Rajouri town. I am participating in the #BlogchatterA2Z challenge and today’s letter is ‘R’. Thank you Tina for your comment and the good words of appreciation! Yes indeed, as India won the overall war, they no other choice but to withdraw.. but being a border town, sadly, Rajouri keeps getting affected by such skirmishes and firing. Rajouri has a rich history and what you said about the head of the state of the Kamboja kingdom being a titular head of a republic makes me wonder if it was a very early form of democracy (of course not with elections like today) with decisions being made jointly that was practiced in the Kamboja kingdom. Thanks Jai for reading and commenting. Yes indeed these were the earliest forms of democracy, though not exactly through an electorate like our times, as you have rightly conjectured. Mentions of these are found in detail in important texts of the past. I thought this was about Rajouri Garden Delhi. Thanks for updating my knowledge Sayan. It's a pleasure to read your blog. Good one Sonia! After all, Rajouri Garden in Delhi is named after the city of Rajouri, so you got the connection someway!